[Untitled Map of Asia] - HOLE, W.
Title : [Untitled Map of Asia]. Map maker : HOLE, W.. Date : London, c. 1614. Size : 9.7 x 14.8 inches. / 24.7 x 37.5 cm. 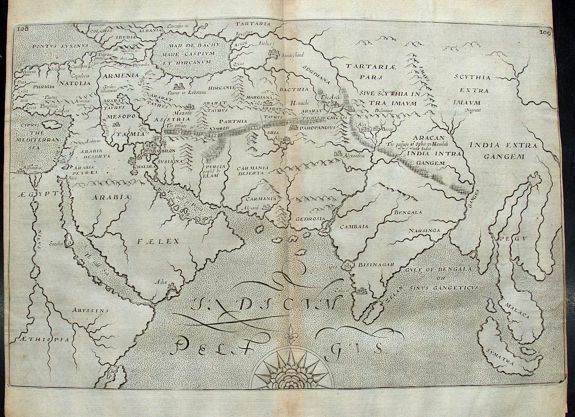 Description :Early and very interesting map of a large part of Asia, extending from Egypt and Turkey to Sumatra, including Arabia, India, parts of Russia, etc. With ancient places and details, such as Babylon, Aden, Samarkand, the passage of Nimrod, the passage of Ophir en Hauilah. Noah's Ark is shown near Mount Ararat. The mythical Chiamay Lake appears in South East Asia, as the source of four rivers in Pegu. Decorated with a large compass rose! Published in Sir Walter Raleigh's History of the World. Condition : Printed on hand-laid paper with a large real watermark. Cut until plate mark on the sides as usual. Full margins on top and bottom. Some age-toning and soft creasing.